7. November - The Gaudium Mass was chosen as one of the five finalists in the Best Inspirational CD Category of the 35th Catholic Mass Media Awards. Thank you to our 2013 contributors (Alejandro Consolacion II, Tinnah dela Rosa, Christian Yanez, Ken Steven, Salai Nai Lynn Htun, James Swu, Eugene Calimag), our writers (Delson Balance and Tinnah dela Rosa) and our promotions team (Michael Liberatore, Miel Penalosa and Jaymee Duran)! We welcome more contributors and online ministers! Come and join our PraySing family this 2014! Thank you for LIKING and SHARING our posts in 2013 and for encouraging us in our ministry! We hope you keep sharing this page to your friends! Together let's change our virtual culture into one that makes room for the Lord. Today we wish to share 2 music settings for the Solemnity of the Epiphany of the Lord on January 5, 2013. The psalm settings "Lord, every nation on earth will adore you" are original compositions by Alejandro D. Consolacion II and Tinnah M. dela Rosa for PraySing Ministry. To download the 2-page high resolution music sheet PDF of Alejandro Consolacion, click here. To download the high resolution music sheet PDF of Tinnah dela Rosa, click here. You may also click on the picture to download the high resolution pdf file. Click here to view the readings for January 5, 2013 via the US Conference for Catholic Bishops website. Imagine that a newborn child could speak. What would he or she want for Christmas? Although our children love the toys and presents we give them at Christmas time, the most profound gift we can all give them is this world... a world that continues to turn, one that we can continue share. In your prayer, we invite you to allow the words and images of the video "The World for Christmas" to speak to you and to move your heart. How are you being moved to live your life such that our children can have the world for many more Christmases to come? Speak to our Lord about how you can make such a choice. Beg him for the strength and perseverance to live out this choice. Together with images by renowned photographer Mattias Klum, Sweden-based The Real Group sings The World For Christmas. Anders Edenroth's song tells us to take better care of our planet so that our children one day also can enjoy its beauty. Our children only want the world for Christmas. May you and I work to restore, to repossess, and make this world last. Let us give them a present for the future. Have a lovely Thursday! Many thanks to the realgroupdotse for sharing the video. Merry Christmas to all our friends and followers! We hope you have a most meaningful celebration of this season! Keep praysing God with us! To download the music sheets with a higher resolution, please click here. Click here to view the readings for next Sunday (December 29, 2013) via the US Conference for Catholic Bishops website. This psalm setting for the Christmas Mass during Midnight is an original composition by Tinnah M. dela Rosa. To download the music sheets with a higher resolution, please click here. Click here to view the readings for the Christmas Mass during Midnight (December 25, 2013) via the US Conference for Catholic Bishops website. This psalm setting for the Vigil Mass of Christmas is an original composition by Tinnah M. dela Rosa. In this responsorial psalm you proclaim God's saving power and invite the assembly to acknowledge and give thanks for them. As preparation for singing this psalm, look each day for an example of God's saving power unfolding and consciously give God thanks for it. To download the music sheets with a higher resolution, please click here. Click here to view the readings for the Christmas Mass during the Day (December 25, 2013) via the US Conference for Catholic Bishops website. 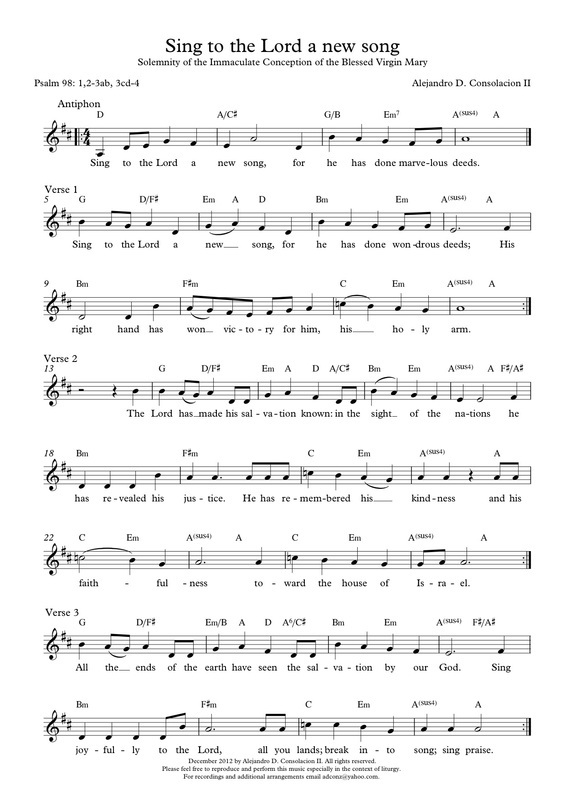 To download the music sheets with a higher resolution, please click here. Click here to view the readings for next Sunday (December 22, 2013) via the US Conference for Catholic Bishops website. What is your wish this Christmas? Do you have a particular longing or dream that you want fulfilled this season? We pray that this Christmas list be yours as well! Have a great Thursday! Many thanks to mitchdtan for the video! As you prepare to sing this responsorial psalm, recall the goodness of the Lord in your life, your family and your community. 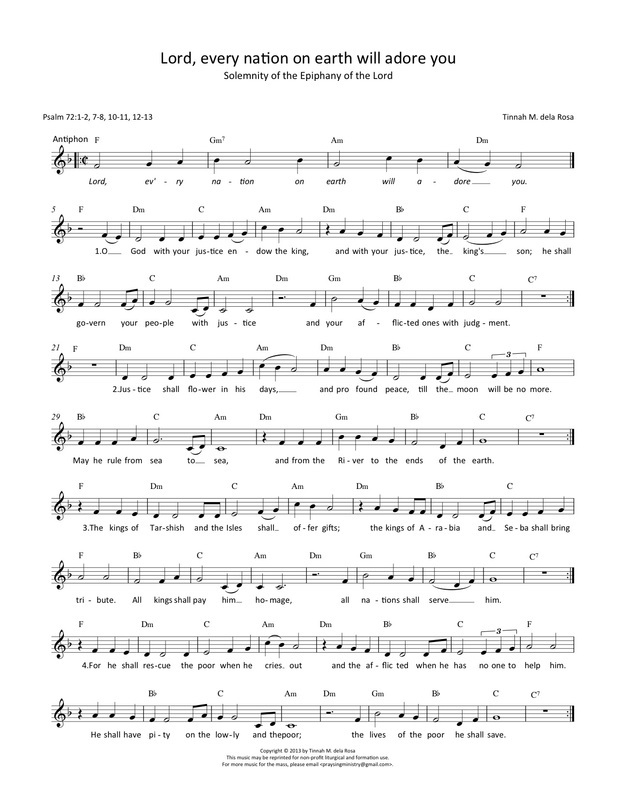 Joyfully proclaim God's goodness as you sing this psalm. 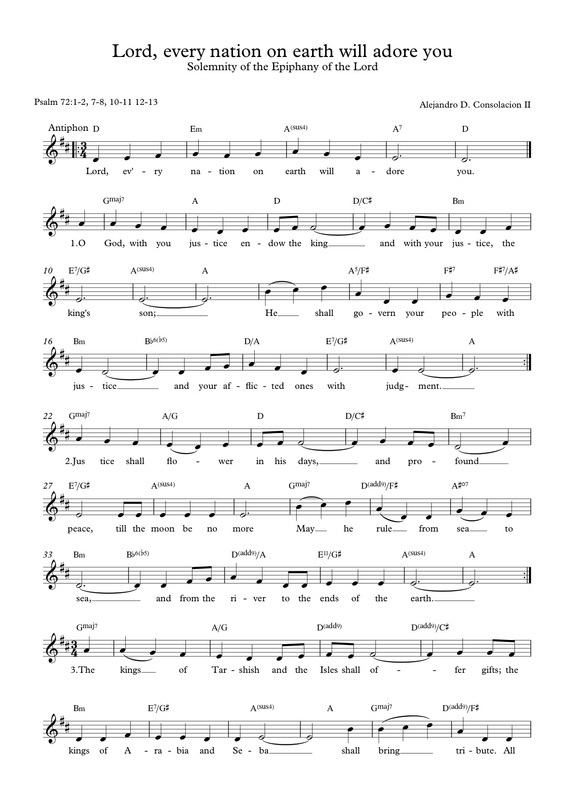 To download the music sheets with a higher resolution, please click here. Click here to view the readings for the Christmas Vigil Mass (December 25, 2013) via the US Conference for Catholic Bishops website. 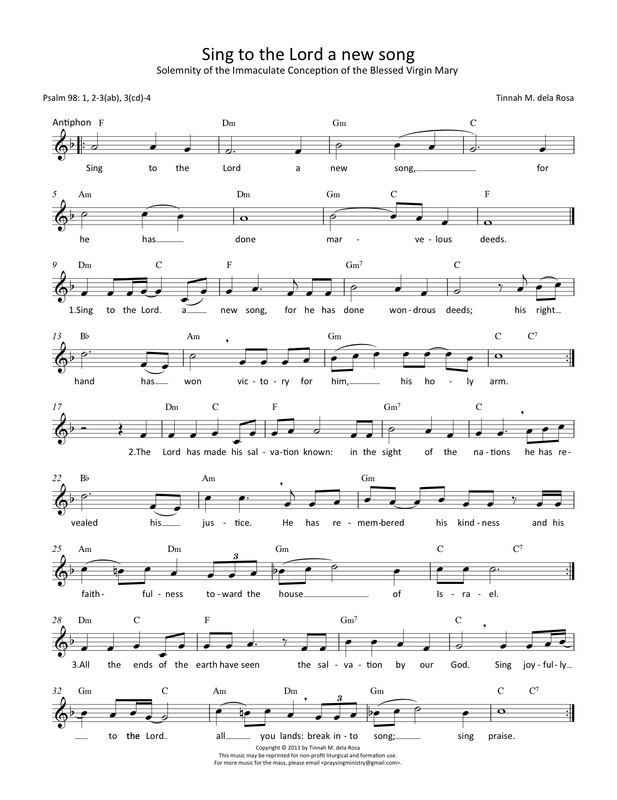 To download the music sheets with a higher resolution, please click here. Click here to view the readings for next Sunday (December 15, 2013) via the US Conference for Catholic Bishops website. What do you do as you wait for someone or something important to come? Do you find yourself anxious or worried? Or do you wait with expectant hope that what or who you are waiting for will not leave you disappointed? The Advent season seems to fill us with a yearning and ache that we sometimes try to fill with Christmas carols, decorations, bright lights, ornaments and gifts. But the very first experience of Bethlehem was rather different. There was great joy, sincere hope and a deep love that the Christ child's coming brought to life. We, too, have our own experiences of Bethlehem - when great joy, sincere hope and deep love was first felt - feelings that do not only come exclusively with Christmas but with an authentic encounter with Christ. As you pray with the song, "Not That Far From Bethlehem," performed originally by Point of Grace, let us remember our own experience of Bethlehem - our intimate encounters with Christ. As we watch and wait for the Lord's coming in our midst, let us not forget that we really are never that 'far from Bethlehem'. The experience of Bethlehem happens whenever there is great joy, sincere hope, and deep love for Him for whom we wait and whenever this love is extended and expressed to each one who journeys with us toward Him. Have a hopeful Thursday! Many thanks to sumconfusion for the video! Today we wish to share 2 music psalm settings for the Solemnity of the Immaculate Conception of the Blessed Virgin Mary on December 9. The psalm settings "Sing to the Lord a new song" are original compositions by Alejandro D. Consolacion II and Tinnah M. dela Rosa for PraySing Ministry. To download the high resolution music sheet PDF of Alejandro Consolacion, click here. To download the high resolution music sheet PDF of Tinnah dela Rosa, click here. You may also click on the picture to download the high resolution pdf file. Click here to view the readings for December 9, 2013 via the US Conference for Catholic Bishops website. To download the music sheets with a higher resolution, please click here. Click here to view the readings for next Sunday (December 8, 2013) via the US Conference for Catholic Bishops website.